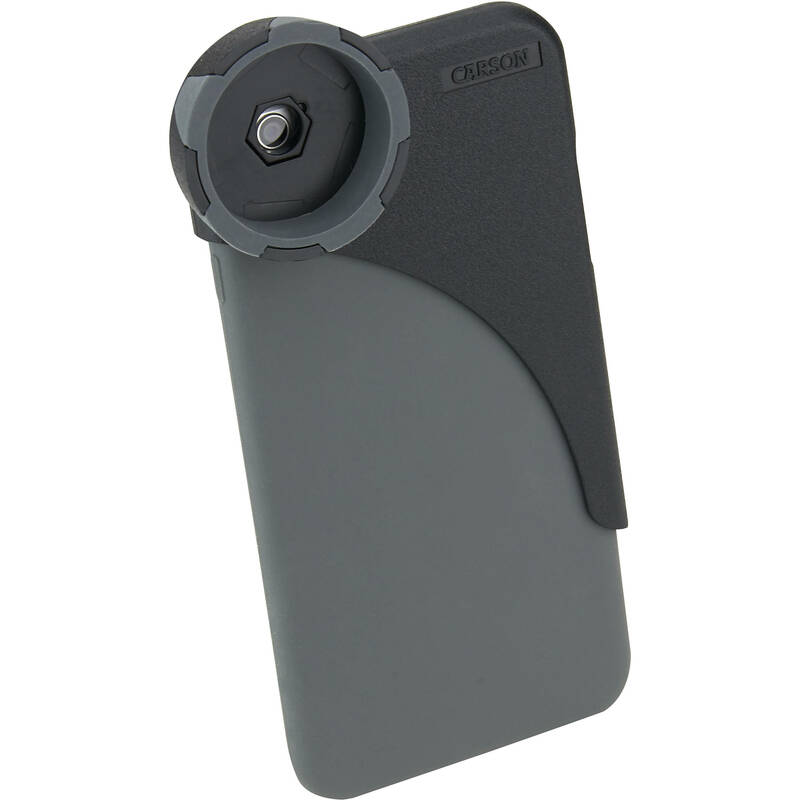 Your binocular can be used as a powerful telephoto lens for your iPhone with the IB-642P HookUpz Binocular Adapter for iPhone 6 Plus and 6S Plus from Carson. Simply slip the adapter's rubber ring over one of your binocular's eyepieces and you're ready to take still photos or video, or to use the iPhone screen as a monitor. Two interchangeable rubber rings enable the HookUpz to fit a wide range of binoculars with eyepiece housing diameters between 40mm and 44mm. Box Dimensions (LxWxH) 7.4 x 3.7 x 1.1"
HookUpz Binocular Adapter for iPhone 6 Plus and 6S Plus is rated 3.3 out of 5 by 3. Rated 2 out of 5 by Richard from Adapter ring too large My binnoculars did not fit the camera adapter ring. I found the case and binnoculars awkward to use. Rated 5 out of 5 by Anonymous from Love it I got this over a year ago. I looked at many higher priced options, but thought I would try this for the price of $15. Works much better than I expected. I use this when I am in a crowd but I want to be able to take a telephoto picture. My passion is wildlife/birding. My main camera is a Canon 5D MkIV with 500 lens and 1.4x mag. The only downside of it is it's size and weight and attracts unwanted attention. That's where this attachment for my iPhone comes in handy. This has different adapter rings. It fits on my Swarovski binocs 10x50. It fits my Nikon binocs. And will fit on my Nikon spotting scope. I always carry this and a spare binocs in my vehicle--just to be prepared. It also works great at major sporting events. A pair of binoc don't attract much attention. I was recently birding in Belize and let my guide use it instead of trying to hand hold his iPhone over his spotting scope. He has overjoyed. Unfortunately for me, he liked it so much, I simply had to give it to him. That's why I'm here writing the review. I'm back to buy another one. Rated 3 out of 5 by Leo in Wyoming from the only option for a 6S. It will work with a handheld monocular or binocular.? Of course shaking is always an issue with this type of application.